first asked if it was Fragrant Bouquet-but I was searching the Hosta Library and now I remember purchasing Austin Dickinson and this has to be it. Yup, I knew it looked familiar, and might be a slightly fragrant one, but couldn't place the name right away. Haven't seen Austin Dickinson mentioned in years. Must be my intake of vitamins this month my memory is getting better. I got this one at least 5 years ago. I remember buying something that sounded like the actress Angie Dickinson and then it hit me. 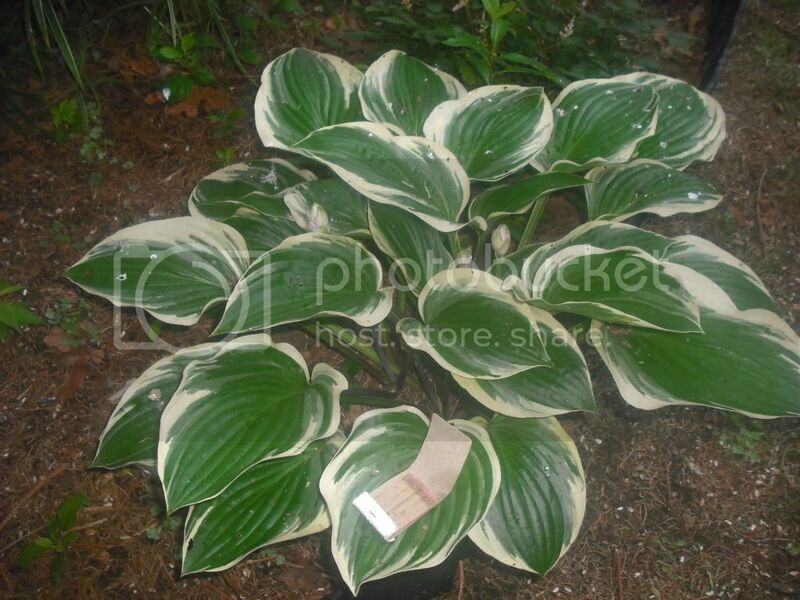 Still looking for my Hosta Bette Davis Eyes I bought at the same time. While looking for another hosta today, I came upon this pot - Austin Dickinson. And a comparison between Austin Dickinson on the left and Emily Dickinson on the right. I put Austin Dickinson into my newest bed last season. It survived - there is some deer munching going on. I won't be posting any Hosta photos here anymore because Photobucket has chosen to blackmail their prior users and charge us $400 to be able to have our photos show up calling it third party hosting. I rarely come on here anymore because of it. Found an open flower on Austin Dickinson yesterday. The flower seems similar to the "Iron Gate" types. A few more flower pictures.